Monash University Associate Professor Ken Harvey AM is the new President of Friends of Science in Medicine. He replaces Professor John Dwyer AO, the founding president. Friends of Science in Medicine, founded in 2011, has grown to become a major critic of unscientific health practices and fraudulent health claims. 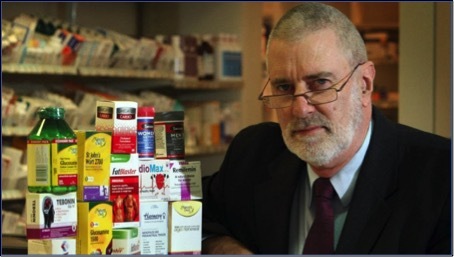 It has advised governments and media, made numerous submissions to enquiries and provided extensive public advice concerning dubious health claims and practices. It successfully advocated the removal of private health insurance taxpayer-funded rebates from ‘natural’ therapies that lacked evidence of efficacy. Professor Harvey said, “Valuing scientific rigor is especially important in an age where unsubstantiated health claims are rampant and scientific consensus is ‘imbalanced’ by the views of extremists”. FSM campaigns against the unethical promotion of therapeutic goods and services to consumers. “We critique unproven and exploitive services offered by medical practitioners, such as the infusion of intravenous vitamins and chelation therapy. We are equally concerned about Traditional Chinese Medical Practitioners claiming that acupuncture can treat infertility or Naturopaths advocating homeopathy” said Professor Harvey. “We encourage tertiary institutions and students of medicine and health sciences to critically appraise therapeutic products and services as part of the courses offered. Complementary medicines provide a fertile field for students to assess the often-outrageous claims made and report regulatory breaches”. Last year, the Therapeutic Goods Advertising Code Council and Complaint Resolution Panel (CRP) were abolished and the Therapeutic Goods Administration (TGA) took over the advertising complaint system. Health Minister Hunt said these measures, “will enable potential harms from inappropriate advertising to be comprehensively prevented”. “Research by members of FSM, and consumer’s lack of trust in the TGA, show that the Minister’s assertion has not been realised” said Professor Harvey. He concluded, “The critique by Royal Commissioner Haynes on regulatory failure in Australia’s financial services industry is equally applicable to the TGA. A failure to enforce the law undermines the authority of the regulator whose fundamental responsibility is to do just that. It also encourages others to break the law, leading to a race to the bottom and consumer detriment. These are important Federal election issues”.